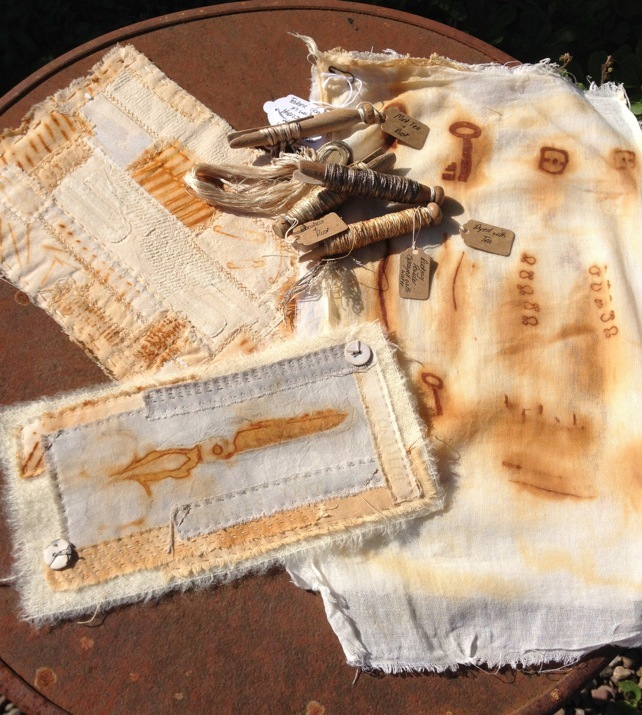 As you may already know I’ve decided to take a break from teaching my own programme of textile workshops for now. However the two that I taught earlier this year at The Restoration Yard, near Edinburgh were such a success, and such fun, that I’ve decided to return to this big, beautiful space this coming October and November to teach just two more! The first one will be one of my favourites (yes I probably do say this about most of them). 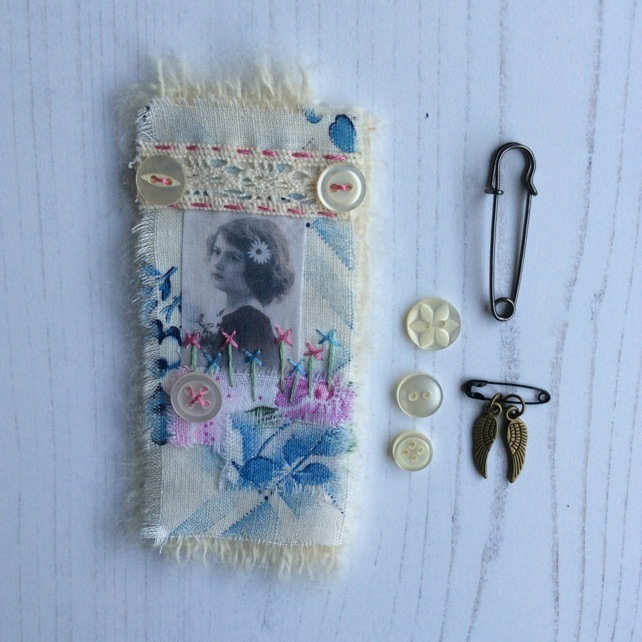 This is a gorgeous day of ‘slow stitching’, nostalgia and sharing stories. 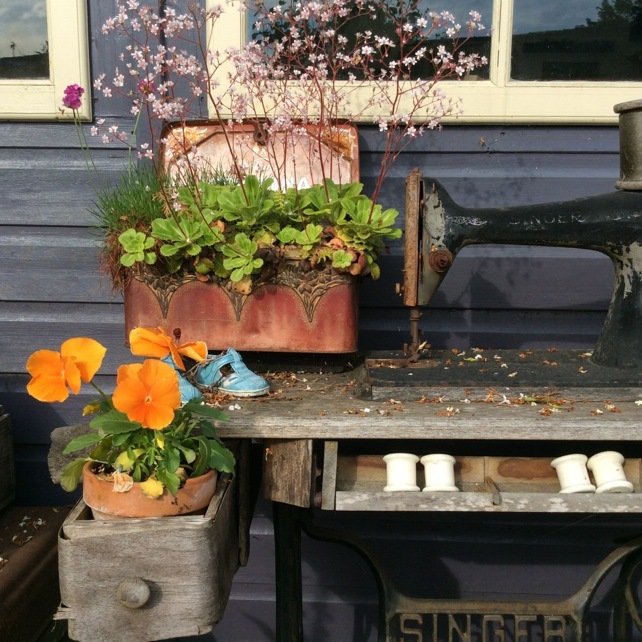 This workshop is perfect for lovers of ‘vintage’ especially those who have fond memories of sewing as a child, of playing with mum’s button box or being fascinated by nan’s sewing box or maybe childhood memories of licking cake mixture out of the mixing bowl and the smell of home baking. 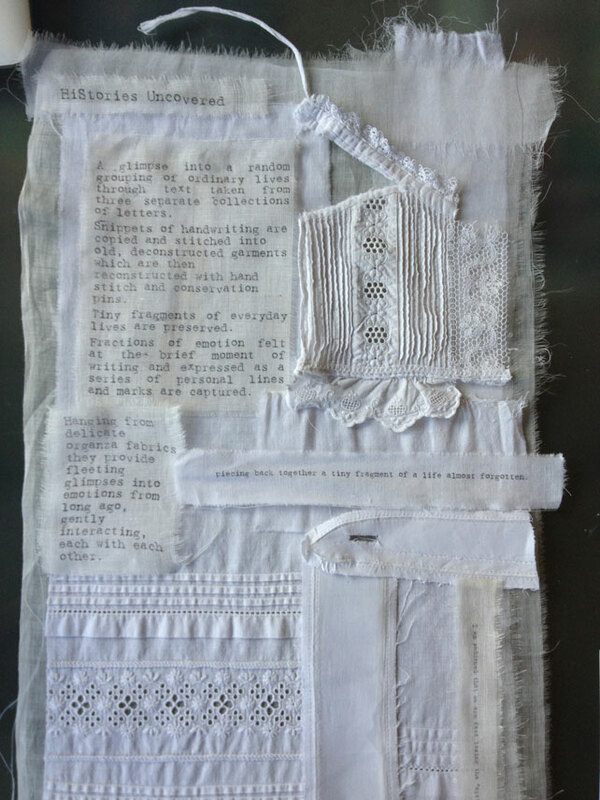 We’ll spend six glorious hours designing and creating a gorgeous textile collage with a ‘sewing box’ or ‘scullery’ theme. 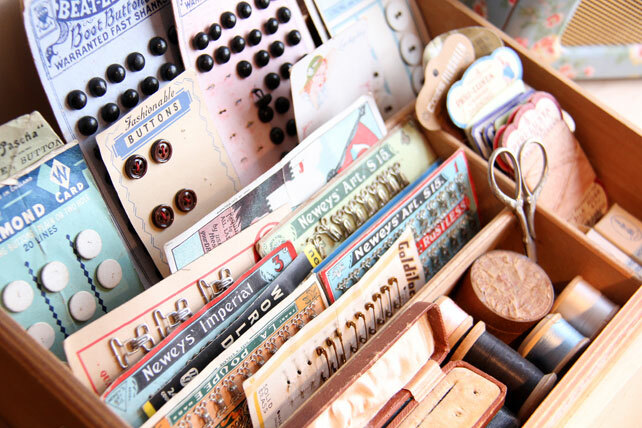 I’ll provide a gorgeous selection of vintage haberdashery treasures! 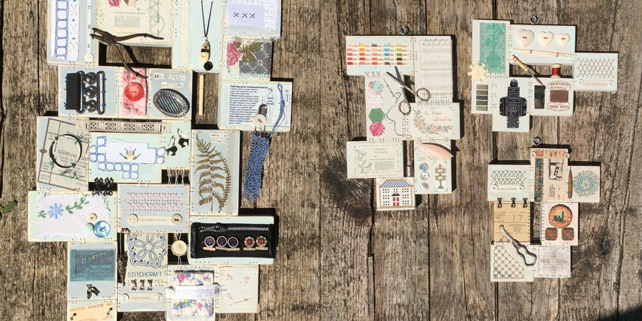 I’ll be raiding my supplies from my studio, The Purple Thread Shed, and will provide a fabulous selection of vintage materials for you to use throughout the day. 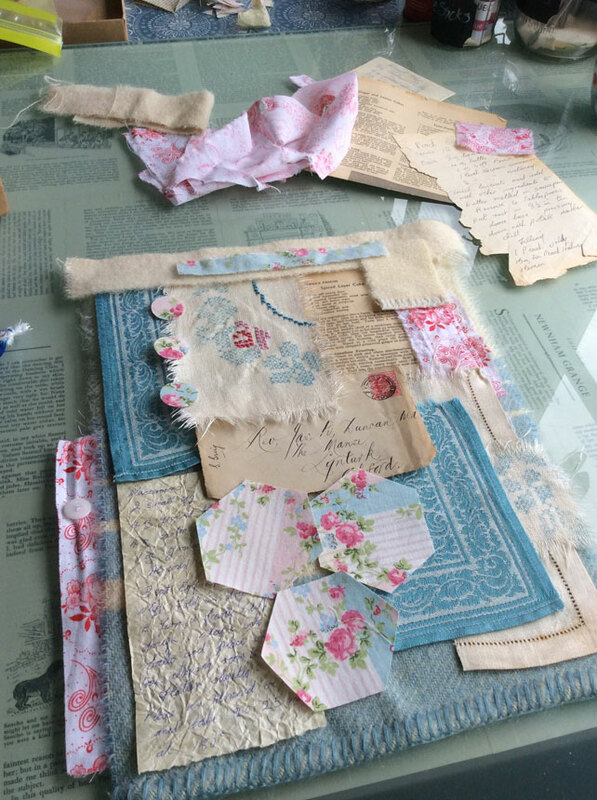 I LOVE using old & used materials so I’ll be looking out boxes of vintage embroidered table linens, 1940s floral fabrics, scraps of old lace, paper from 1950s magazines and vintage dressmaking patterns and anything else that comes to hand while I’m packing. 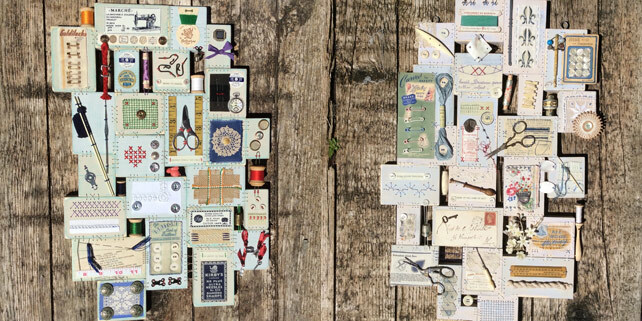 Ooh maybe some old quilt fragments and definitely a great selection of vintage haberdashery. 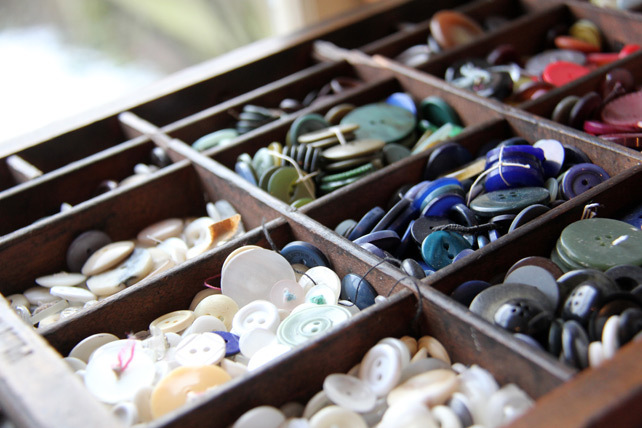 And for all you who love to rummage through a good old ‘button box’- there will be buttons…lots of buttons!! 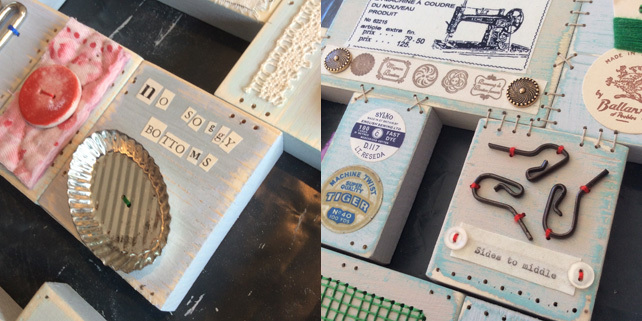 Buttons…all old & used, bringing their own stories! I’ll also prepare some printed fabrics to bring along. 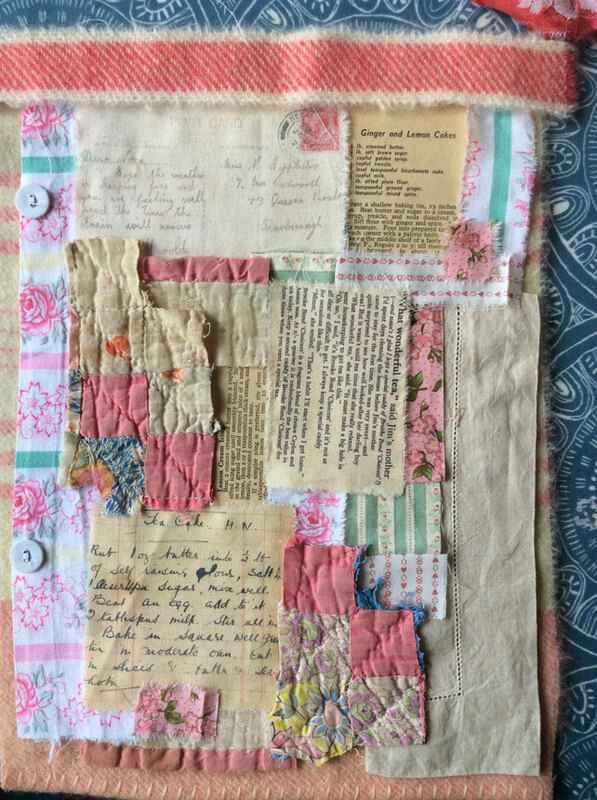 These will be printed from text and images from old sewing magazines, books and jotters and some of my precious vintage recipe books. There isn’t time on the day to print your own fabrics, but I’ll talk you through how it’s done and provide a great selection ready for you to use. I’ll work with everyone throughout the day. I tend to demonstrate a few techniques and then work with people individually because you’ll all be doing something different and completely personal. 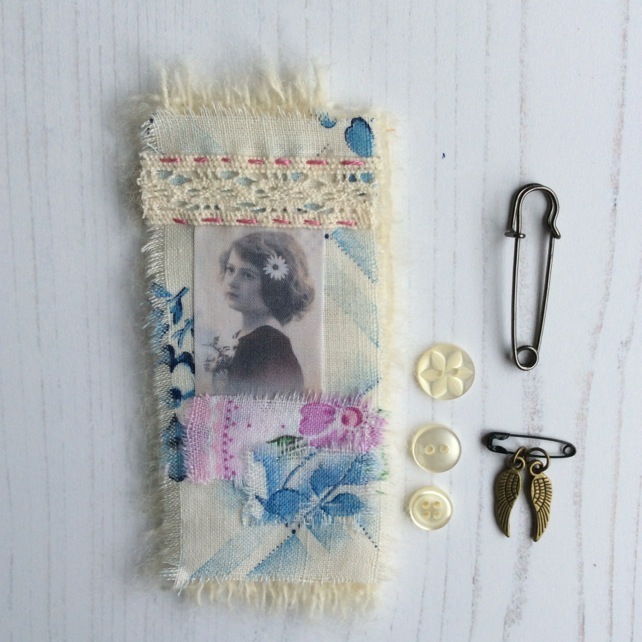 While I provide all the materials that you’ll need, people very often bring along their own bits & pieces to work with. 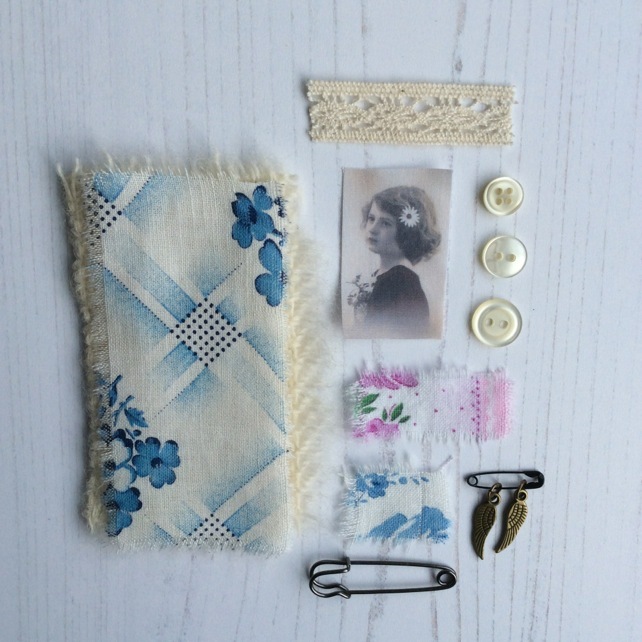 What could be more personal than using your own fabric treasures collected throughout the years from your own family stash? I’ll give suggestions for what to bring when you book your place but do know that you can turn up completely empty handed – perfect for those of you who don’t have a minute to swing a cat (there’s something not quite right about that) or for those who don’t have a stash of their own! 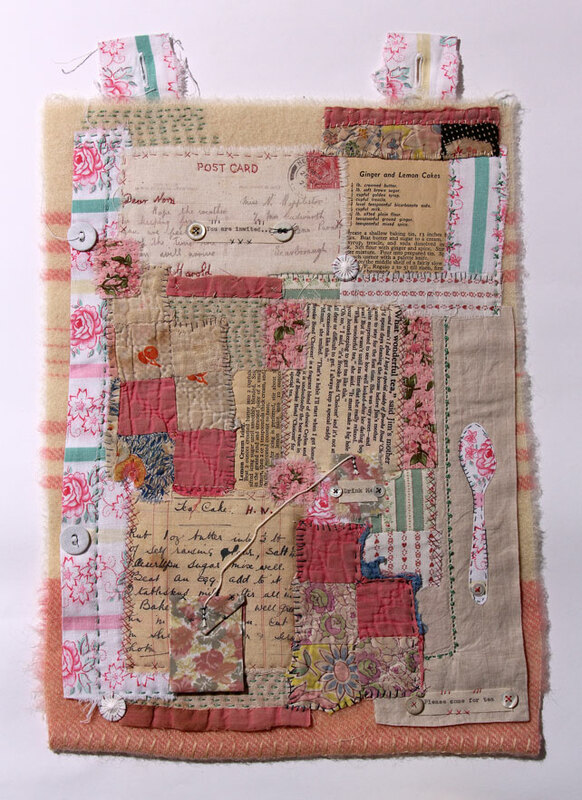 So – using an old woollen blanket as a ground, I’ll show you how to piece together a gorgeously scrappy background from our vintage fabrics and papers. This is a lovely intuitive process and be warned – it will take much longer than you think! 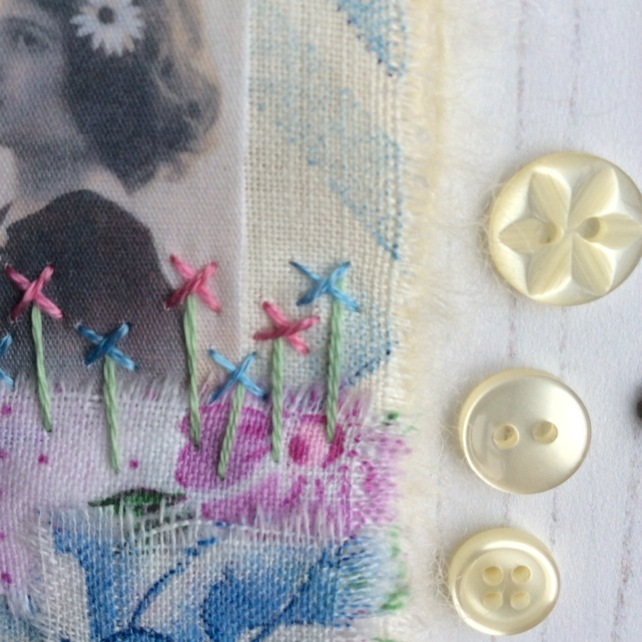 You’ll add more pattern using old haberdashery (don’t you just love that word?) and then you’ll be ready to start the lovely process of slow hand stitching. 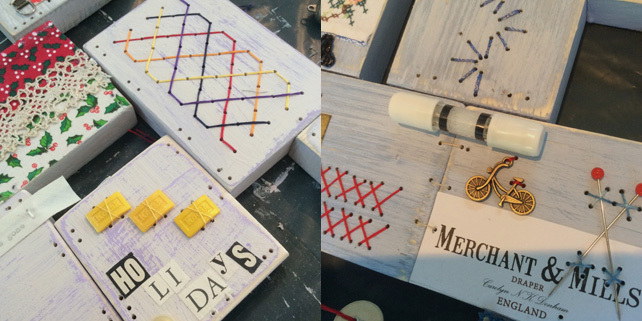 Simple straight stitching is all that you need – or be more adventurous – up to you! 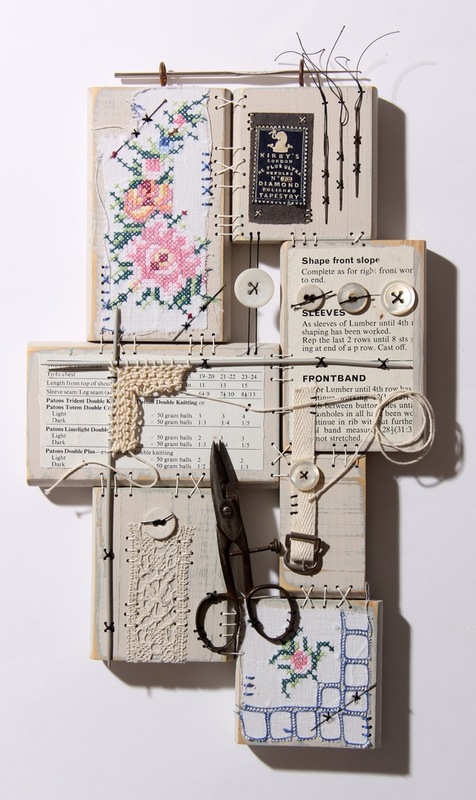 Don’t worry if you’re not an experienced stitcher – running stitch and cross-stitch are all you need. 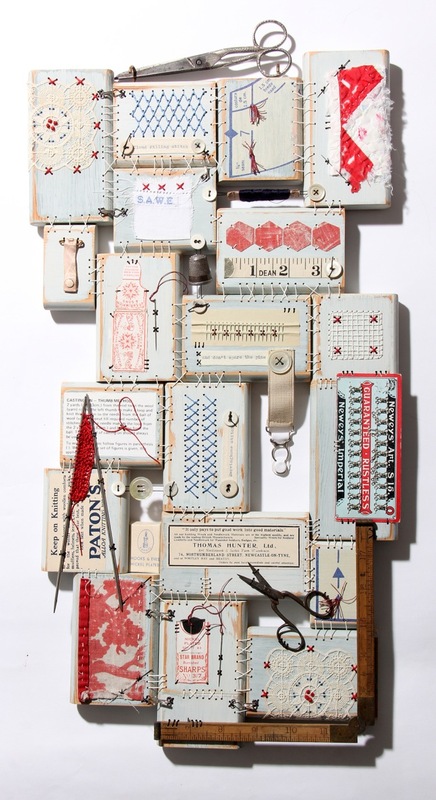 A love of textiles and scrappy vintage style is far more important! I encourage people just to start stitching. Once you get started, ideas will grow from there – I promise! 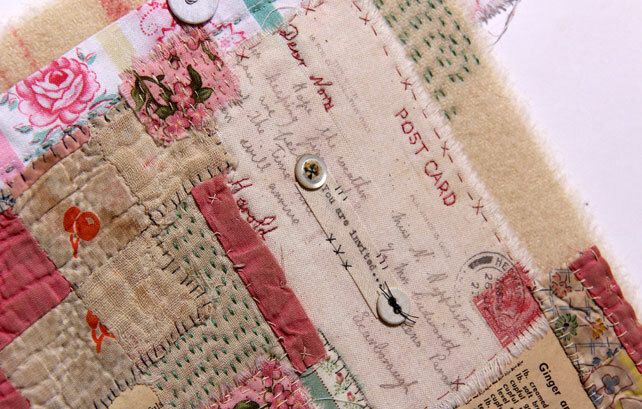 I’ll help you to create balance and flow in your design through your stitching and bring all of these scrappy little patches together as one gorgeous piece. 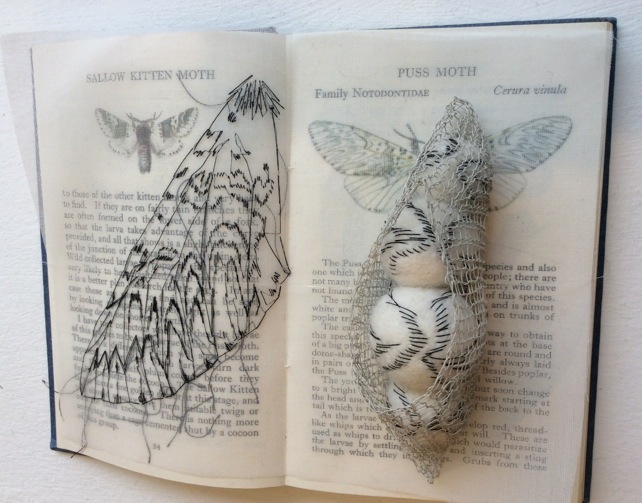 If you feel more adventurous, I’ll demonstrate some of my favourite stitches and will bring along a lovely selection of vintage ‘stitch’ books from my growing collection! Neat perfect stitching is not the order of the day, making lovely personal ‘marks’ with needle and thread most definitely is! 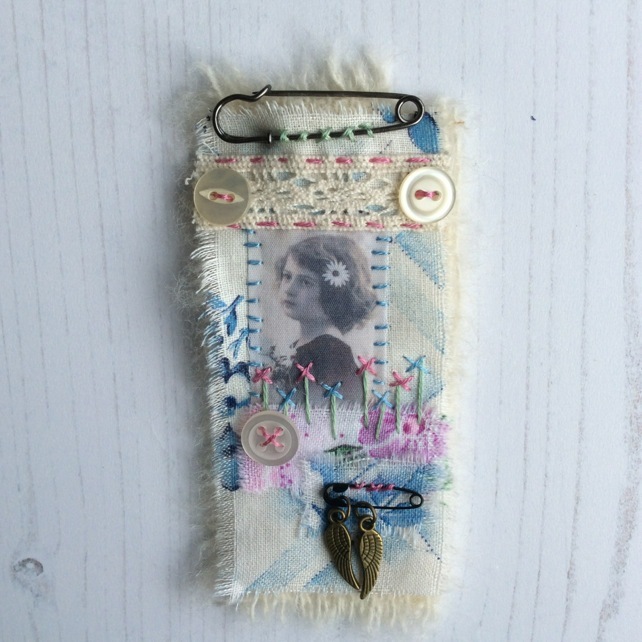 ‘Dear Nora”‘ – stitching complete! Warning! The picture above is to tempt & inspire you BUT don’t expect to finish your hanging on the day. Hand stitching is slow, as is the design process. I’ll give you all the guidance you need to finish your gorgeous project at your own pace at home. The Rev Duncan – stitching complete! You’ll find out all the details here and I’d love to have you join us!! Patchwood Christmas Trees on Saturday 17th November at the Restoration Yard. You can find out the details here and do book soon as there are only a few places left. Find out where else I will be teaching and I’d love to hear from you if you would like me to teach in your own gorgeous craft venue or to your textile group. 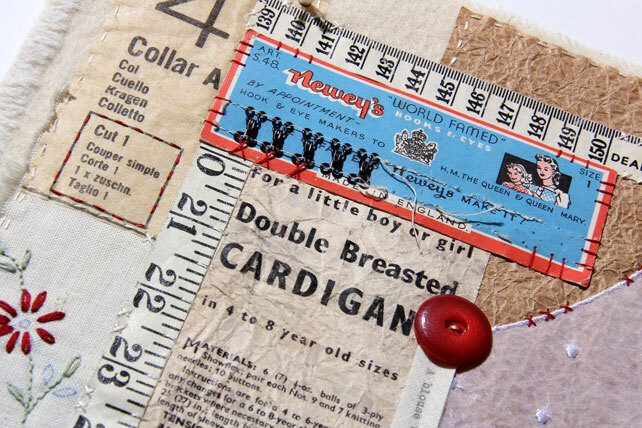 PS – Can anyone accurately count the number of times the word ‘vintage’ is used in this blog? Clue – it’s an awful lot and I even took loads out!! A Round White Collar – inspired by my personal memories of a home where we ‘made it ourselves’. 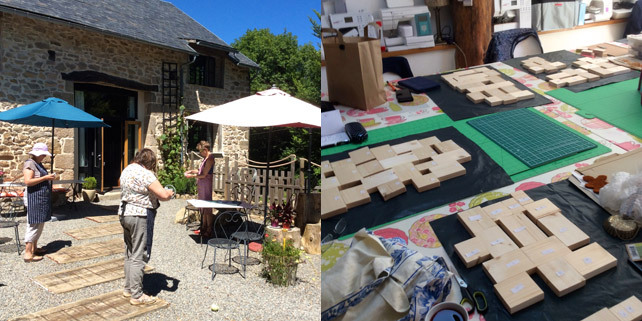 Following on from part one of this blog about my recent week teaching with Phil & Fran at Crafty Retreats in beautiful, rural France. Although much of our week was spent in the studio we were also given the opportunity to do some exploring out and about. We discussed the options during our first evening and decided that we would have two half day outings. 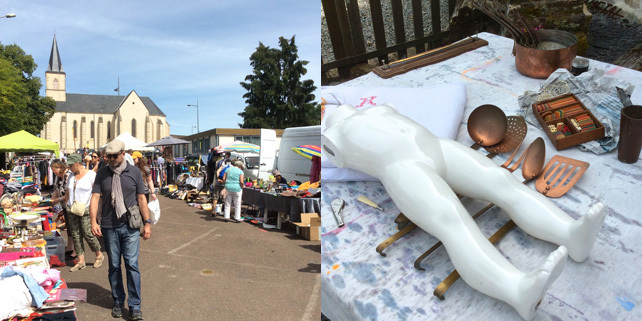 So on the Sunday we set off in search of tatty treasures at a couple of ‘Vide Greniers’. The first was pretty much a car boot sale with more people behind each stall than there were visitors – clearly a bit of a family day out. ‘Treasures’ were short on the ground though I did get an absolutely beautiful monogrammed linen sheet for 10 euro and Paul and I also found a great set of brass & copper cooking utensils for 5 euros. They’re not particularly old but beautiful crafted (Paul knows a good rivet when he sees one) and as we’re doing up our kitchen and kitchen related ‘stuff’ was on our wish list we were happy. We were even happier at the next stop when we found a set of small copper pans for 20 euros – these ones are old and will clean up a treat! 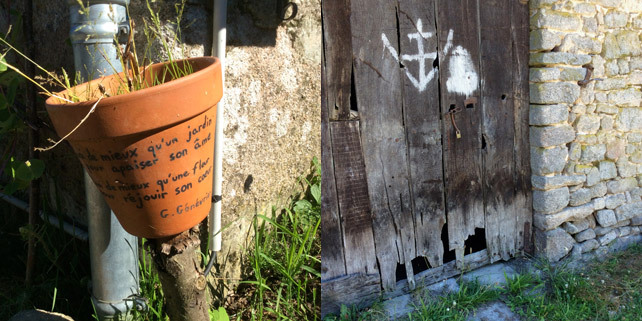 There weren’t particularly rich pickings here either – just a few bits and bobs. I found some lovely old envelopes and Phil found a 1990s 1 year old child mannequin without a head or arms and priced at all of 4 euros it had to come home with us – worth it just to make the ‘it’s armless’ joke if for no other reason!! 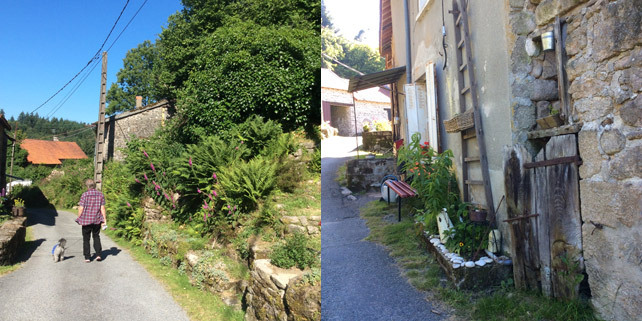 We split into two groups for our outing with half setting off to explore the ‘butchers quarter‘ in Limoges and the other half of us opting to visit Oradour-sur-Glane. It’s a very sobering and poignant experience and I can’t even begin to tell the story here. It’s hugely thought provoking and should be experienced if you are ever visiting the region. 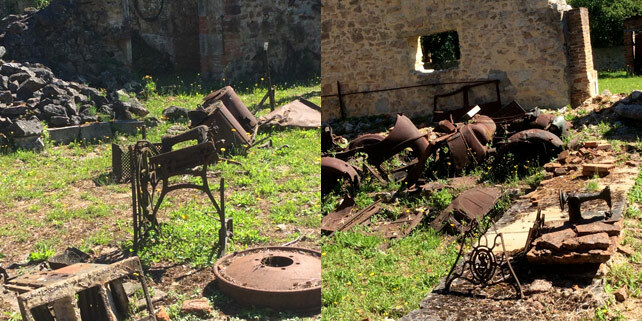 I was truly fascinated by the number of houses with old Singer sewing machines amongst their ruins. I had been told to look out for this but really wasn’t quite prepared for the impact. I’ll maybe say more in a future blog, maybe not – maybe just something to ponder on myself! As the week and our Patchwood Samplers progressed Phil had the wonderful idea of creating a ‘Group Sampler’ to display on their stand at the Festival Of Quilts. Everyone was tasked with creating a personal patch and Oscar the pooch agreed (?) to represent the animal team (2 dogs, 2 cats and 1 tortoise) by having his paw printed. He looks most engaged in the whole process! Time did fly and all too soon we found ourselves on Day 8 with everyone preparing to leave on afternoon flights. There was some last minute finishing off in the studio in the morning (everyone did finish their pieces and some people even left with more than one), some frantic trying to fit into suitcases (although we had taken this into consideration in all our planning & designing throughout the week) and then we came together for an emotional ‘Show and Tell’. Even I, who had continually been working with everyone throughout the week, didn’t quite appreciate the extent of personal stories in each and every finished sampler. For me it is a huge mark of success when people get emotional talking about their piece of work and I think a few ‘family heirlooms’ were established. 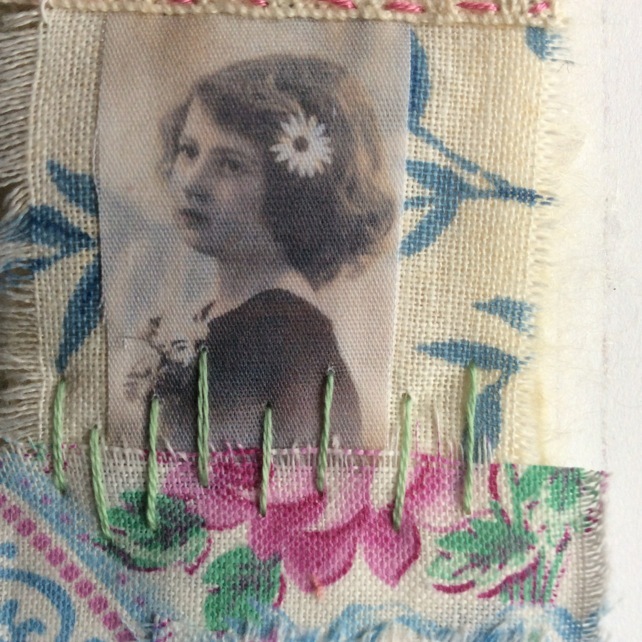 Irish roots, a love of sewing and childhood memories and ‘sides to middle’ – see part one for the story behind this phrase. A collection of family antique ‘treasures’ with a bunch of tiny wax flowers from a wedding cake. Can you spot the brooch by Hens Teeth? So many family treasures – an old christening bracelet and a grandson’s hospital tag, dancing awards and a pair of pliers from dad’s tool shed. 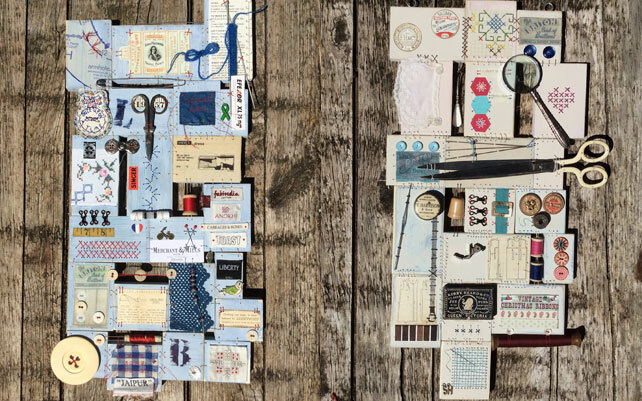 Stories of bicycles and breathalysers (see previous blog post), a lifelong passion for dressmaking a love of blue, labels and all things Liberty. Sewing box treasures – an unexpected gift of a pair of old scissors and mother in law’s thimble -probably the biggest thimble I’ve ever seen! Celebrating family roots, a love of all things fibre and some naturally ‘mushroom’ dyed yarn. Oh where to start celebrating the life of a much loved mum with memories from entertaining 70s style. Loving the fragment of ‘fur’ coat and the scrap of lurex fabric from the ‘party apron’! The week ended all too soon. Despite teaching in the studio from nine in the morning until seven in the evening (and more) I left with as much energy as I had when I arrived and that has just got to be the sign of a fabulous week. A week of being so generously looked after by Fran & Phil and making such lovely new friends in the most very gorgeous of settings. I even got a ‘night night’ kiss from Tutu the dog every night (because I asked him nicely not because he was dishing them out I hasten to add). Actually if it wasn’t because I was coming home to Annie the Purple Thread Shed pooch and a little grandbaby, I don’t think I would’ve wanted to leave at all. ‘The Last Supper’ A glorious week of delicious food, stories & friendship. What next? We’re returning in 2020 for another week of Patchwood Samplers and maybe some Patchwood Tenements thrown in for good measure. And maybe even another week of something quite different – more news of that later. But in the meantime bookings for the Samplers has already started and as there’s only eight places I’d get signing up quick. Paul & I quite literally can’t wait to return. We’re expecting that ‘SPACES’ sign to turn round to ‘FULL’ pretty quickly! Turn left at the hole in the tree! 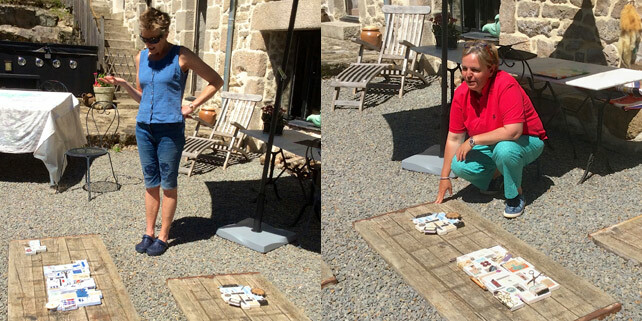 A couple of years back I received a most exciting email from Philippa & Fran of Crafty Retreats inviting me to join them in France in 2018 for a week’s teaching. Of course I absolutely jumped at the opportunity and planning began. Now, sadly, it’s all over except to reflect on a glorious week, lovely new friends and the satisfaction of seeing some beautifully thoughtful Patchwood Samplers coming to life over the time we spent together. I got really excited when I started thinking about the actual programme for the week as I realised that we’d have time to make one of my full size Patchwood Samplers. My problem was the amount of equipment and materials involved and the thought of packing everything onto Ryanair seemed a bit impossible. Husband Paul quickly came to the rescue and suggested we both go, pack everything into the back of my mini clubman and have ourselves a road trip. 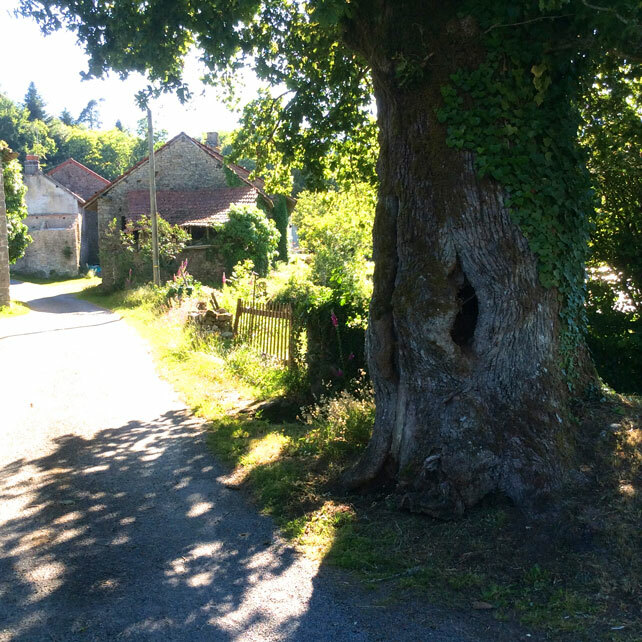 So with the help of Tom Tom and several stop-overs en route we drove from Edinburgh to the Limousin region of France until, finally, we ‘turned left at the hole in the tree’ and arrived in the tiny hamlet of Mallety. Any ‘nerves’ left as we went through the gate and a smile hit my face that I don’t think left me for the entire week. 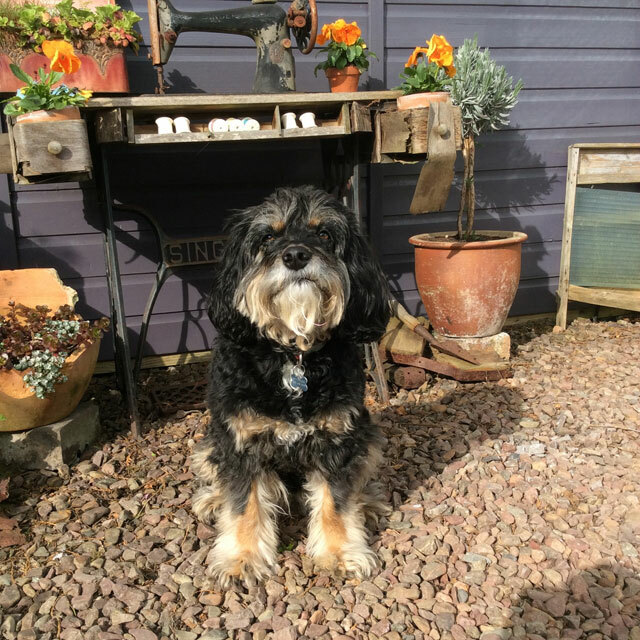 Gorgeous welcomes from Phil & Fran , as well as the lovely Lee & Jackie, a couple of ‘early arrival’ participants, and introductions to ‘Tutu and Oscar’ the pooches followed by a perfect cuppa outside in the courtyard. We were then shown to our ‘home’ for the week and the all important studio. I have to tell you that this place is stunning – I really am still grinning! The second farmhouse, Paul & my ‘home’ for the week and the gorgeous studio! So time to get to work (still grinning). We got the car unpacked and everything into the studio. Phil, Jackie & Lee set to work hanging Patchwood Samplers onto every available wall space as I unpacked the boxes of vintage materials that I had brought from The Purple Thread Shed. I made up everyone’s ‘party bag’ and we were ready to go. Paul deserves a seat by the way having not only done all the driving but also having cut about 300 patches of wood before we left home!! I always love unpacking the materials at the start of a course. 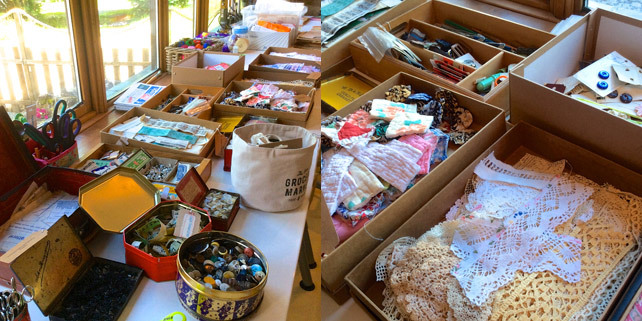 I’d brought along everything needed to make ‘sewing box’ inspired samplers – vintage buttons & haberdashery, old floral French fabrics, handmade lace scraps that I’d found in the Textile Tent at Newark, old paper patterns and lots of other lovely treasures! 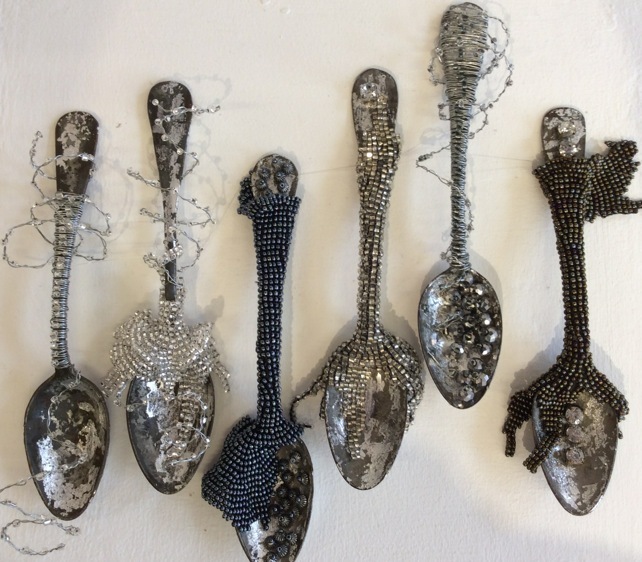 Materials are really important – for me they have to be old and used, tatty and torn before they are of any interest, each tiny scrap embedded with its own hidden story. The rest of the day passed in a blur of sunshine, food and cups of tea until it was time for Phil to do the airport run and pick up the new arrivals for the week. 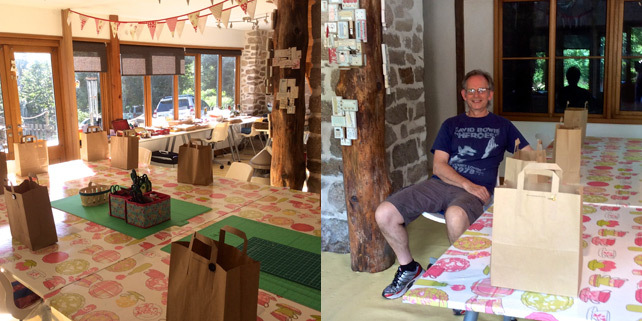 Paul and I explored our farmhouse – yes it was actually big enough to ‘explore’, unpacked our bags and generally wandered about feeling pretty smug. I was heard muttering ‘this place is completely stunning’ – a lot!! Did I tell you that there is a hot tub outside next to the studio?? There is actually even a hot tub outside next to the studio! Suddenly everyone was here and we were all meeting for the first time, glass of fizz in hand munching on delicious canapés made by Fran. Our furthest traveller was Trine who had come all the way from Newfoundland and not for the first time either, such is the lure of this place! Everyone was shown to their rooms and before we knew it, we were all sitting round the beautiful farmhouse table having our first meal together. Gorgeous food, wine and chat with the loveliest group of women that I could imagine. Mostly people travelled alone, two friends travelled together and one brought her camper van, her husband and her dog setting up camp outside our farmhouse! 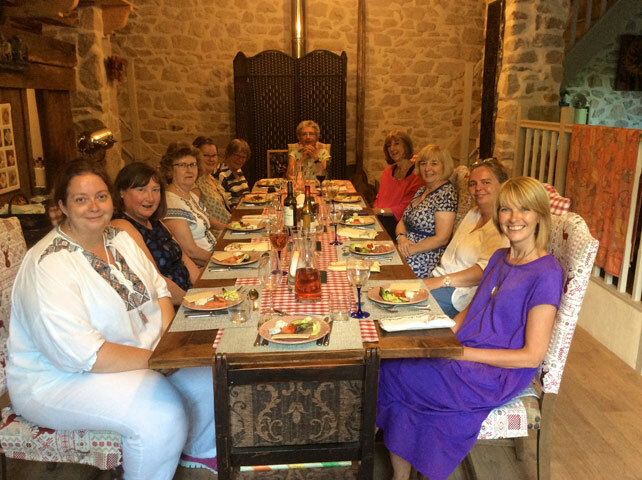 With only eight participants everyone gets to know each other pretty quickly and something I really did love about the week was sitting round the table at mealtimes, sharing stories. On the first full day we woke up to gorgeous sunshine (as we did every day) and everyone made their way to the studio for an impressively early start. 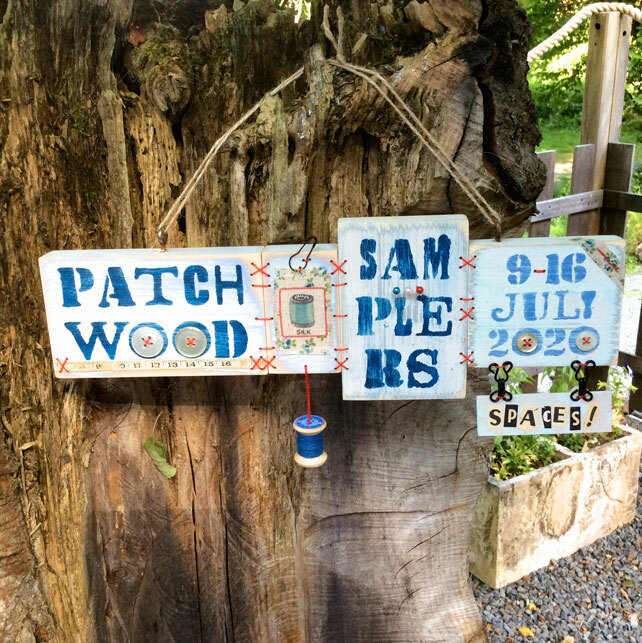 I explained about my Patchwood Samplers and the story behind them and also pointed out that it was not only a week of making but also a week of listening and telling stories, of reminiscing and thinking. I gave everyone a simple handmade ‘sketchbook’ to capture some of the thoughts and information that we would be gathering over the week ahead. Explanations over, work started in earnest as people started sanding their 24 ‘patches’ of wood. I showed how to start playing around with layouts for their Patchwood Samplers and then all the patches had to be painted and finished. This was a lovely social way to get the week started and this activity took up a good chunk of the day. 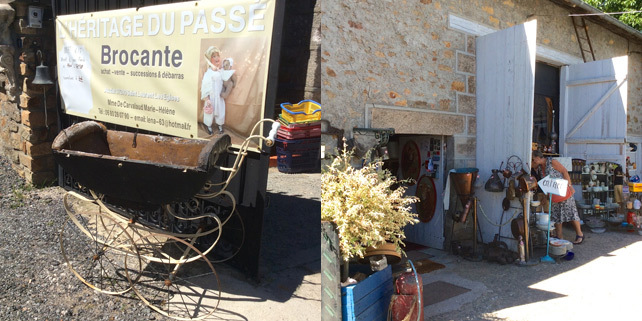 We planned an afternoon visit to ‘Marie-Helene’ the local Brocante and spent a lovely hour or so rummaging there for little bits & pieces that we could include in our samplers. Yes I do realise that I have the best job ever!! Back to the studio and to the really exciting bit of starting to design our ‘patches’. I love when everyone starts to produce their own little collections of ‘treasures’ that they have brought along with them. I always, always get ‘the envy’ at some of the beautiful bits and pieces. 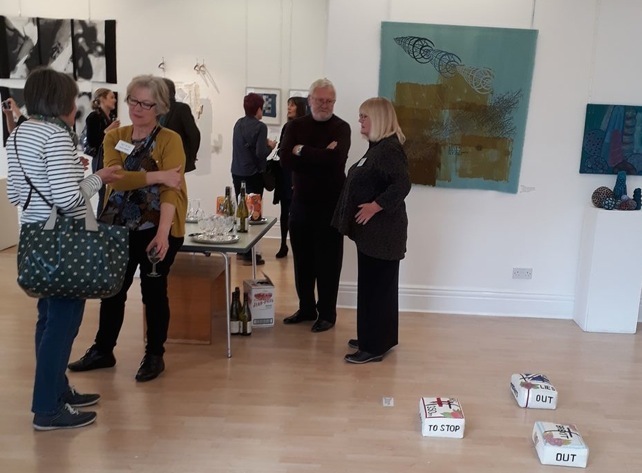 Boxes, tins and bags started to emerge with everything from real collectable pieces to the plastic top of a beer keg – memories of entertaining 70s (I think) style! Lots of playing around. Lots of arranging and rearranging and rearranging all over again. Great progress made on the first day and by the time dinner was ready around 7.00pm, I think it’s safe to say that everyone was addicted! Another gorgeous dinner by Fran accompanied by lovely conversations left me feeling that Day 1 had been a good day. Turns out that it wasn’t to end there though as just about everyone piled back into the studio after dinner. Entirely voluntary I hasten to add – there were no thumb screws used or even any threats (my favoured method of coercion). I left them to it and wandered off back to our farmhouse to fall straight into bed. This pretty much formed our pattern for the week! Up early – delicious food – studio time – coffee & cake – studio time – delicious food – studio time – coffee & cake – studio time – delicious three course dinner & wine – back to studio for most but home to bed for me!! The second day started with a catch up and then a lesson in planning and marking our patches for stitching and a lesson in using the drills including a health & safety warning about using drills after dinner and accompanying wine! I have to say that A LOT of drill bits were harmed in the making of these pieces, so much so that we enrolled Paul as official ‘drill tec’ and it’s fair to say that it was a role that kept him on his toes throughout the week. I think people are amazed at how long these Patchwood Samplers actually take to make – so many hours of work go into them. I think they’re also amazed at just how addictive it all becomes. And all the more enjoyable for being able to wander in and out to work in the glorious sunshine. Whenever things start to seem difficult my advice is always ‘put it down, step away and then come back with fresh eyes’. A little wander round the hamlet of Mallety is just the remedy and Paul and I snuck off for a wee explore with Oscar the pooch as a willing companion. A sobering reminder of times gone by. The symbol of the resistance and a V for Victory painted on a barn door. 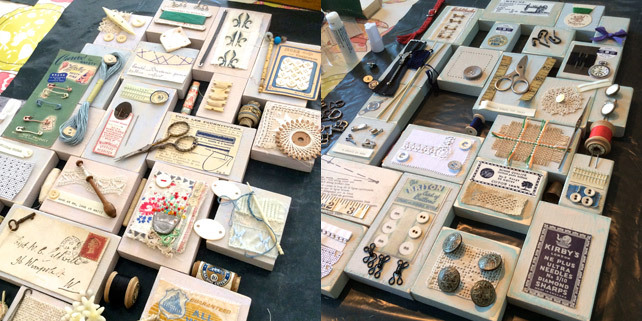 The upshot of people choosing to spend so much of their time in the studio meant that some really intricate pieces started to emerge in the first few days and develop throughout the week. There is ‘thoughtfulness’ behind each and every patch and once confidence starts to grow, so does ambition. There is no ‘one size fits all’ for these – we’re continually problem solving and working out how best to go about things. I have no idea how best to attach a ‘plastic beer keg top thingy’ but if you give me a minute I’ll come up with ideas! 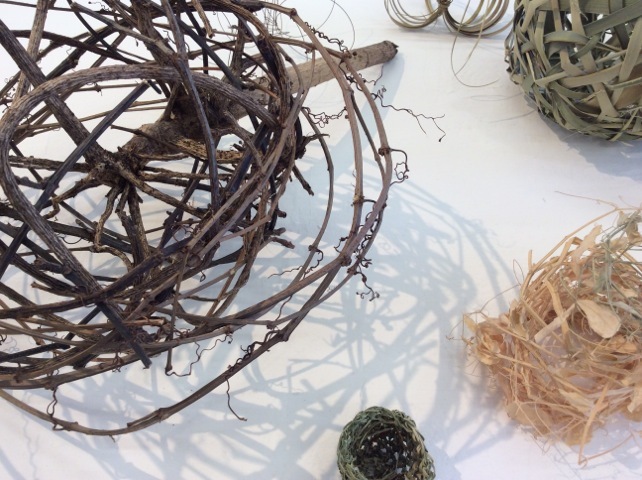 The lovely thing is that everyone soon starts to come up with their own ideas – most work, others not so much but the trick is to work out which it’s going to be before holes are drilled! 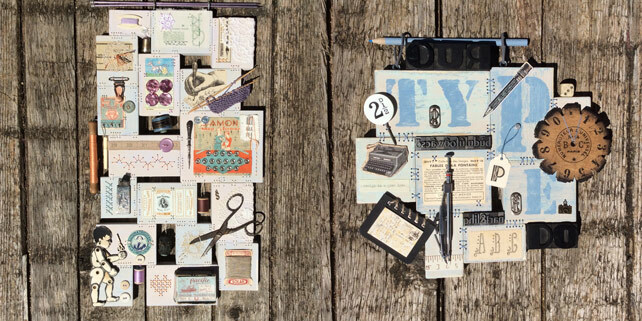 Text added with a 1960s typewriter and ransom notes cut from vintage magazines. The gorgeous coloured stitching in the above picture is a pattern in bell ringing – seriously! The white plastic tube thingy and little bicycle charm is a reminder of a story that unfolded on the first day involving a husband (who is an expert cyclist), a bike ride on the scale of no normal person, a sat nav with no signal, phones with no signal and a random ‘don’t worry about me but if you could work out where I am that would be splendid ’email. This led to discovering he is over 60k away absolutely in the middle of no-where and trying to get directions to him (with barely any phone signal remember), darkness falling and finally a rescue mission. The white plastic thingy – a breathalyser from Paul & my ‘RAC driving in France kit’ was to check that Phil could drive after having wine with dinner. Luckily she could and the rescue was made and husband was grateful having already cycled around 80k and was at the point of looking for a barn without a dog in it that he could bed down for the night! I told you there were stories a plenty and you couldn’t make them up! Part Two of this blog with tales of our excursions and our final finished Patchwood Samplers to follow. 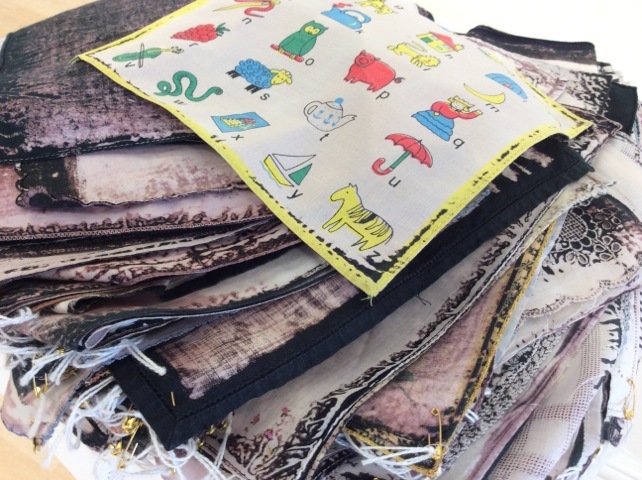 New Year, new plans , new textile workshops! FEBRUARY UPDATE: Yikes how embarrassing – several of these listings have changed since I wrote this blog post!! Do check out my workshop page for an updated programme. Oh yay to be sat at my desk today after three weeks of working on the building site that is currently our home. It feels great to have bare feet rather than wearing steel toe caps and its bliss not being covered from head to toe in a fine layer of plaster dust! I usually rather grudge ‘desk’ days compared to ‘studio’ days but today I’m feeling pretty content – making plans for the next few months and setting my priorities for the year. So to start by wishing you all a very happy and successful 2018. I’m excited by my year ahead. Last year didn’t quite go according to plan so that’s made me more determined than ever to make more time for my own textile work as well as developing my textile workshops. I’ll look forward to sharing my news of ‘goings on & happenings’ here on my blog – I’m determined to make time to update it and get myself just a wee bit more online savvy! I do already have some fabulous workshops lined up this year. I’ll be visiting Sally at Needle & Thread not just once but twice as we have just added a sneaky wee date in June in addition to my two day visit in September. 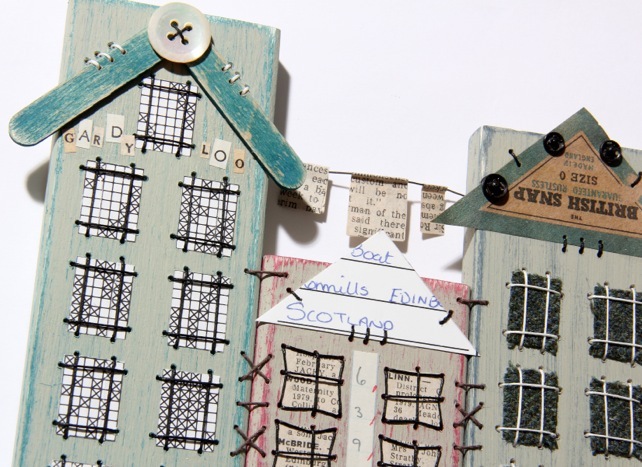 In June we’ll be making Patchwood Tenements and in September we’ll be making Patchwood Samplers: Personal Collections and Scrappy Story Collages. Bookings are already underway and as always places are limited. If you’ve not visited Needle & Thread before it is a gorgeous venue in Lincolnshire where Sally runs a fantastic programme of workshops. 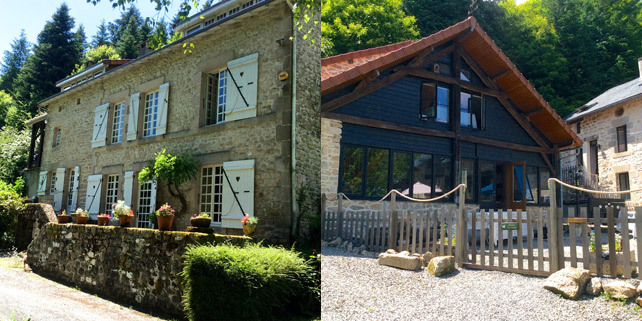 I’m hugely excited to be teaching on my first ever retreat in June this year in rural France with Crafty Retreats. 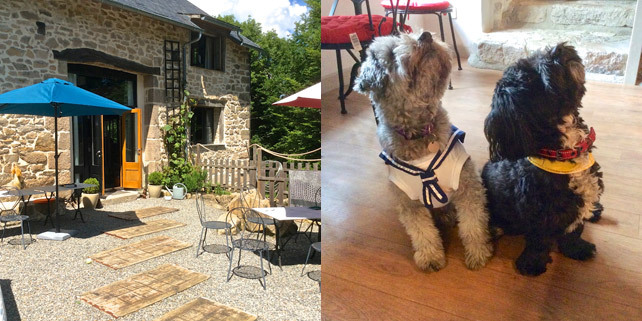 I’m sure I’ll be banging on about this much more in the months to come but if you could fancy spending a week in the sunshine in the most gorgeous studio situated in the Limousin area amid the forests and low mountains of the Monts D’Ambazac then do check it out quickly as I think there are only a couple of places left! 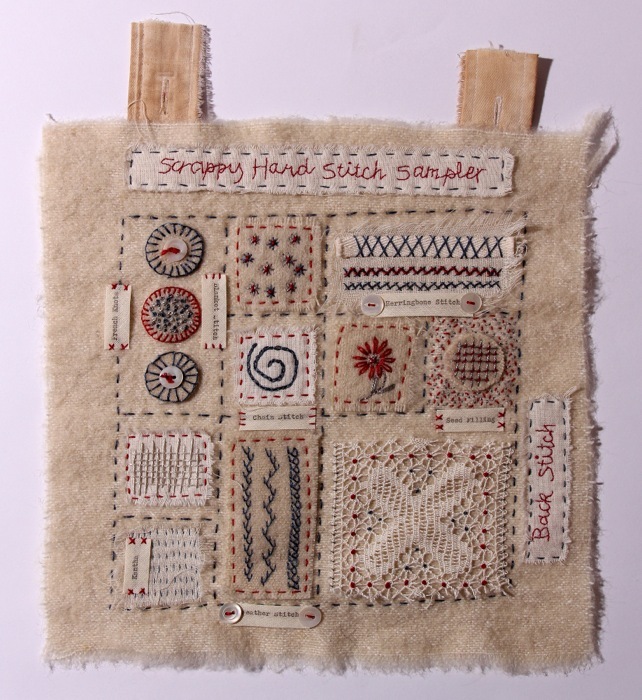 We’ll be making Patchwood Samplers – my original full size ones with twenty one wooden ‘patches’ all embellished with your own little treasures. It’s going to be the most gorgeous week of creativity, friendship, delicious food and local excursions and I for one have to keep pinching myself to make sure that it is for real! My own workshop programme is currently listed on my website and I’ve made BIG changes to the way that I am doing things. I’ll be hosting workshops in two very lovely local (near Edinburgh) venues over the next few months. My venues have been carefully chosen as places that have the same quirky vibe as my own studio The Purple Thread Shed. 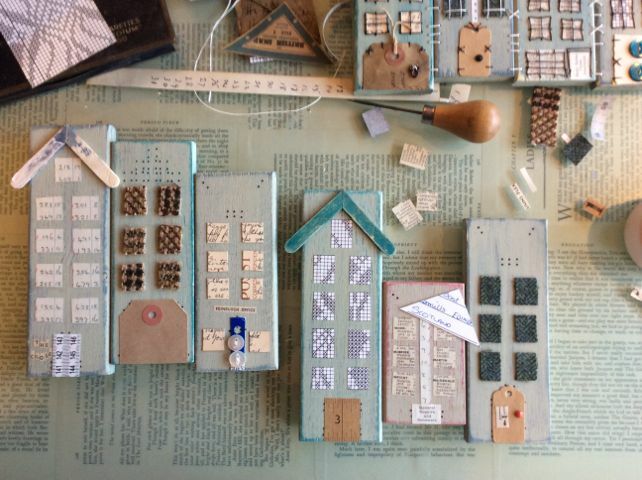 I’ll be starting the year at the Wellbeing Lab within The Restoration Yard at Dalkeith Country Park with my first workshop ‘Patchwood Samplers: Personal Collections’ on Saturday 10th February and then in April we’ll be making ‘Patchwood Tenements’. I do know that people love visiting my own studio so I will open the doors to The Purple Thread Shed for a few workshops in May & June. 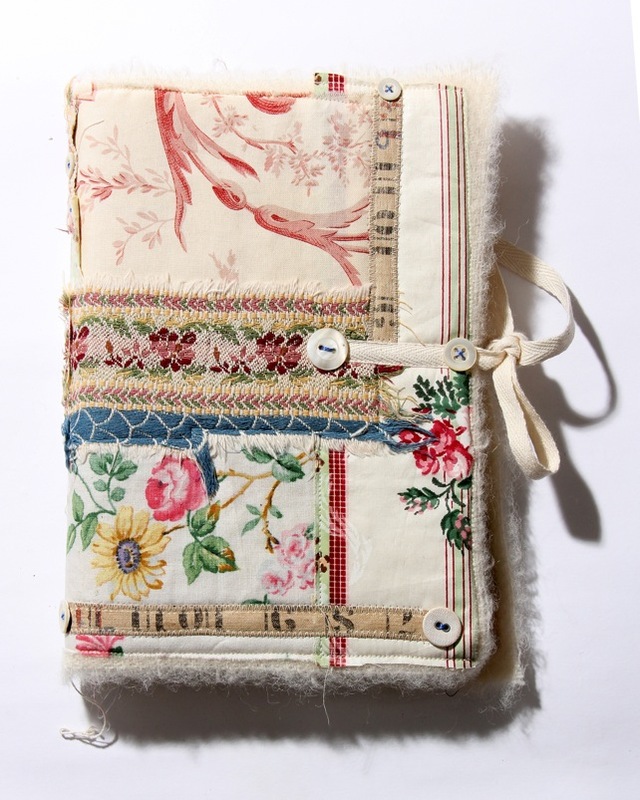 There are only four places on each so early booking is essential starting with ‘Handmade Journals’ & ‘Patchwood Samplers: Natural Collections’ in May and followed by ‘Rusted Samplers in June’. Hopefully I’ll be able to restore my garden to it’s summer glory by then – it’s currently looking very sorry for itself as it’s been been ravaged by the house renovations. So that’s a wee round-up of what’s going on – I’ll be posting more details & pics of individual workshops as we go along. 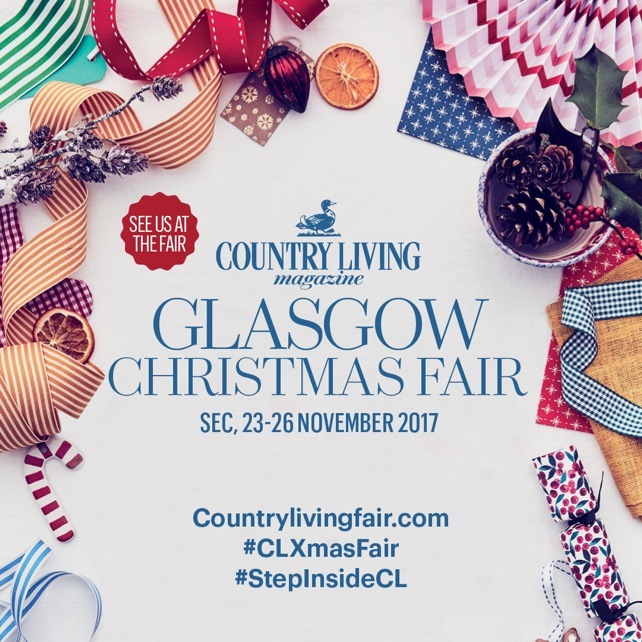 I’m really excited to be teaching four workshops this weekend in the Crafts Theatre at The Country Living Christmas Fair in Glasgow. 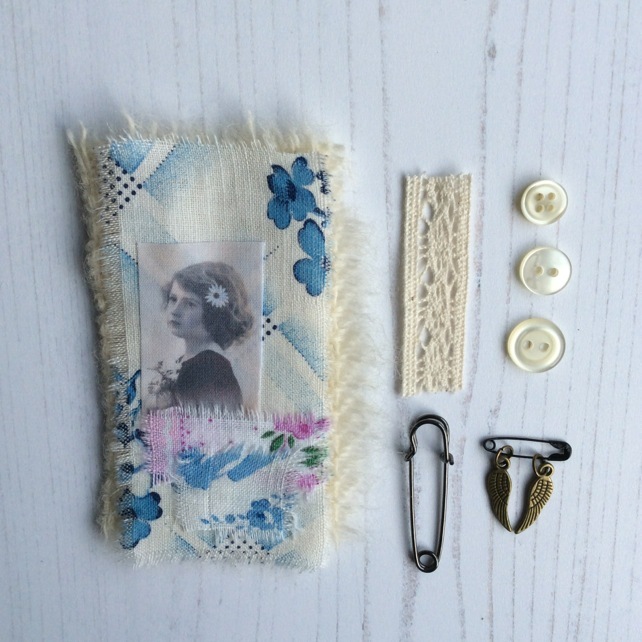 I’ll be showing how to make a rather lovely vintage style bag brooch. 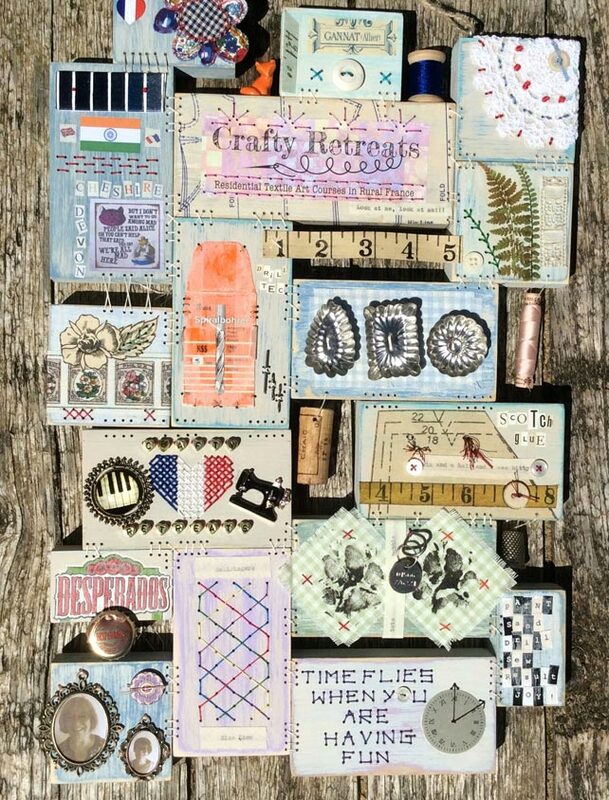 I don’t know whether this is a real thing or not but they look great pinned to a cloth bag or can simply be hung as a teeny miniature textile hanging. In addition to your kit you’ll also need a glue stick (I use Scotch) and a needle of course! Use the glue stick to put glue on the back of your photo. Try to get glue to the edges but don’t use too much – you don’t want it to seep through the fabric. Stick the photo about 2cm from the top, ever so slightly to the left rather than bang in the middle. Put glue on the back of the two small floral scraps. Slightly overlap the bottom of the photo with one scrap and then layer the other on top. Stretch the lace fragment over the top of the picture and using two strands of your thread stitch down with a running stitch. 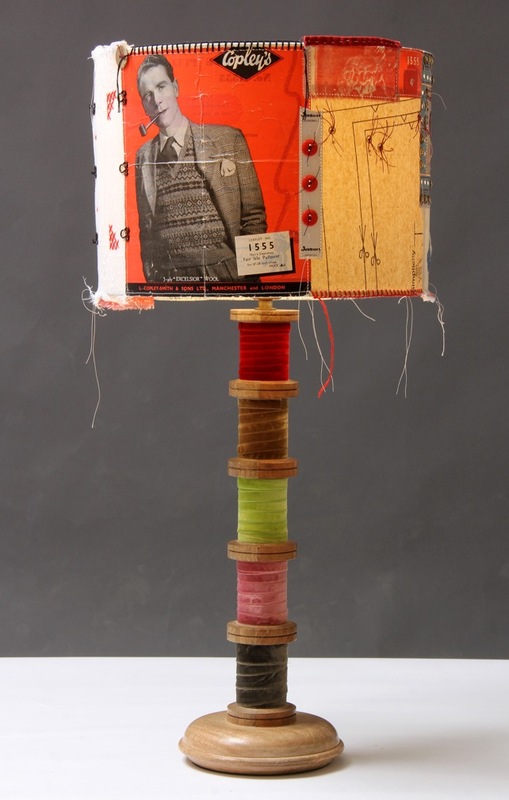 Each colour of thread in your pack is made up of six fine strands of cotton. Pull out each strand individually and then put two back together and thread your needle. 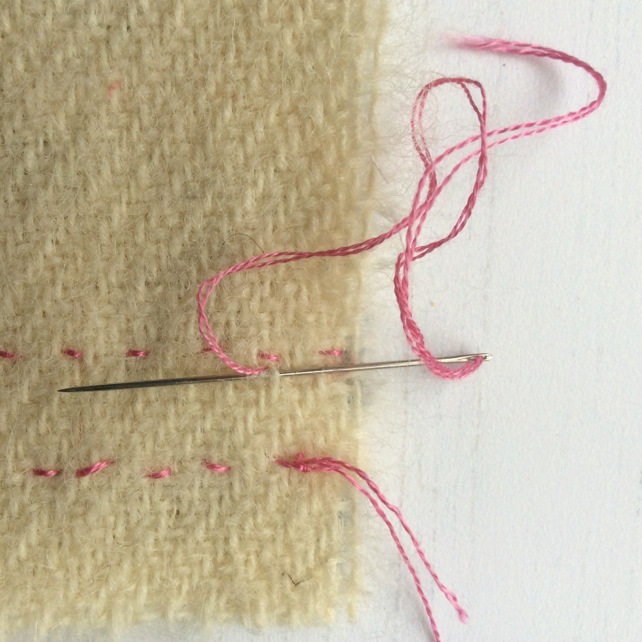 Start and finish your stitching by making two or three teeny stitches into the back of the blanket layer – be careful not to go all the way through to the front. 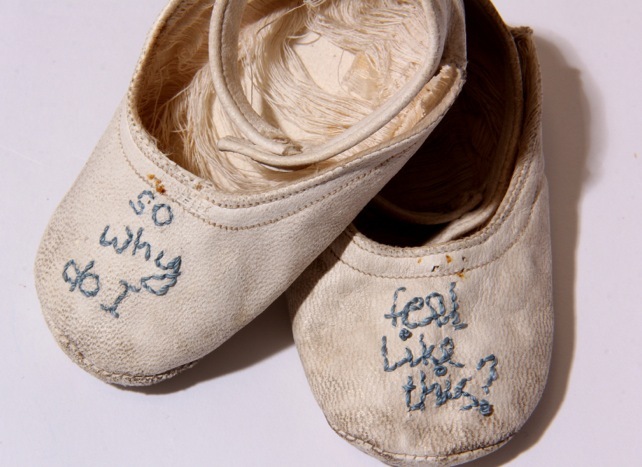 Tiny stitches in the back of your work. 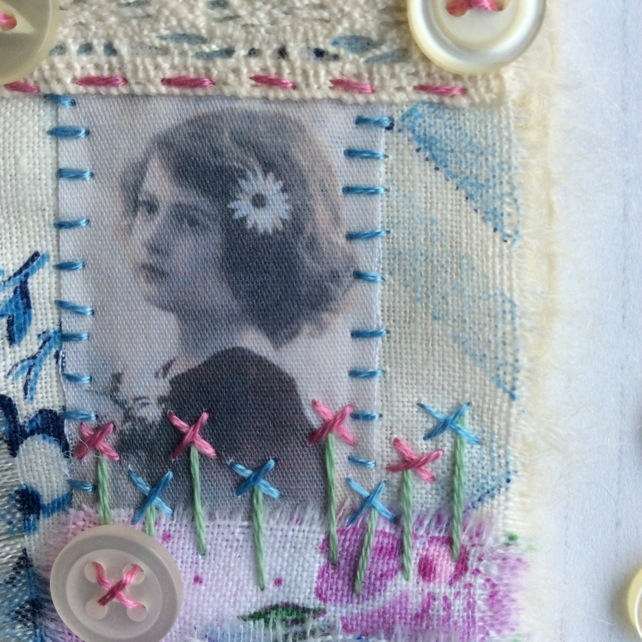 Make some long, straight stitches along your floral scrap going up onto your photo. Make them uneven – about 8 in total. Stitch little crosses at the top of these. 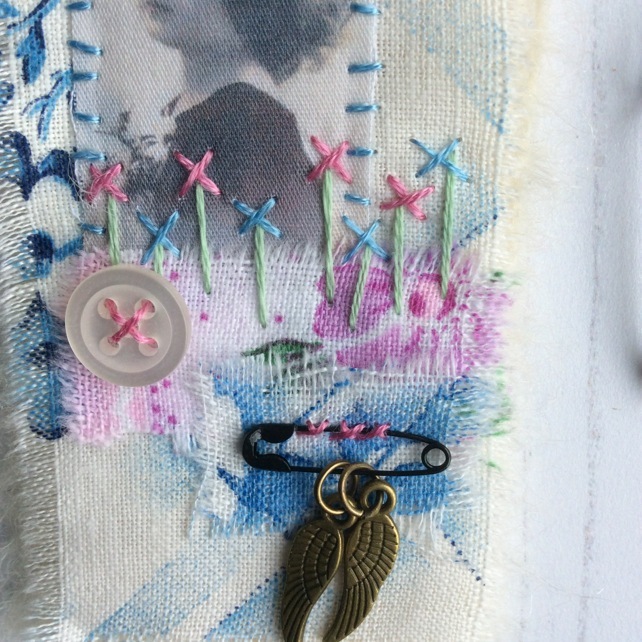 Stitch a button at each end of your lace and one at the bottom of your picture. 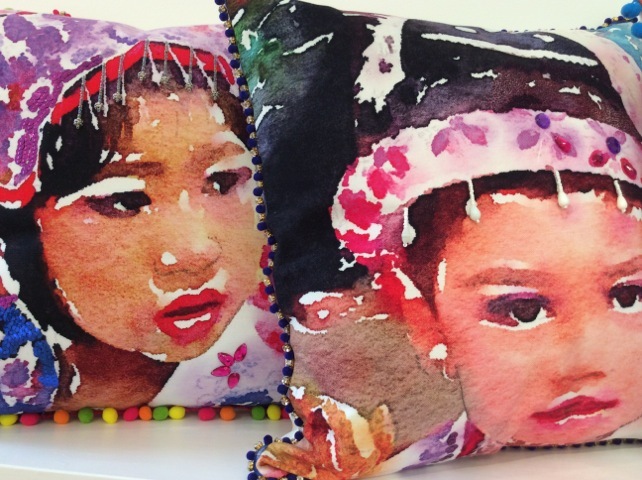 Make little stitches over the side edges of your photo – these don’t have to be even. Attach your safety pin at the bottom. You can either pin it into the blanket or stitch it with 3 little crosses. Attach your kilt pin to the top by stitching a row of cross stitches. I start with one in the middle and then make another two crosses on each side – before you stitch check that the opening part of the pin is to the top! 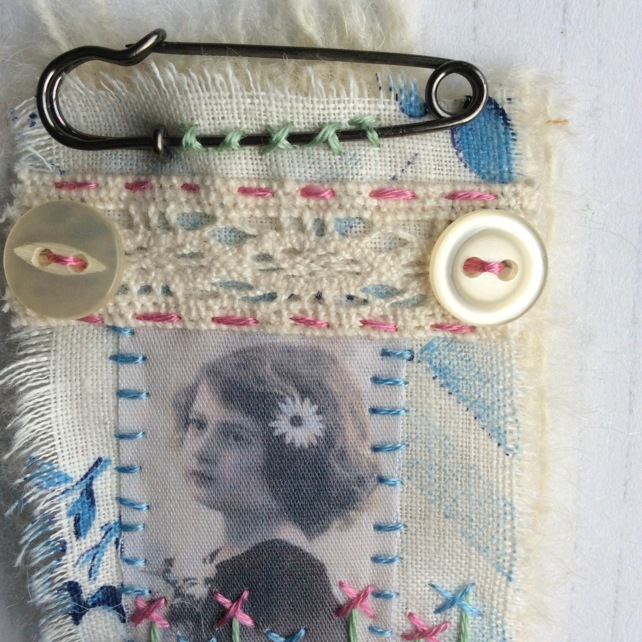 Ta da – the finished brooch! And Finally – Enjoy wearing! Oh my goodness I’ve been pretty rubbish at updating my new website and posting on my blog so far. The problem is that whenever I have a lot going on, I go into ‘radio silence’ – which is kind of unhelpful for social media! My head gets so involved in what I’m actually doing that I totally forget to take any photographs. Also, although I do mentally write lots of blog posts while I’m taking Annie the pooch out walking, I somehow never quite get round to writing them for real! Anyway I’m here at last and bringing some exciting new workshop news. But first a wee update of goings on. It’s been rather gorgeous outside The Purple Thread Shed. We’ve been lucky to have had some gorgeous days over the last couple of months. I’ve finished all my workshops at The Purple Thread Shed for the summer and I’ve closed the shed door to visitors for a while. The reason being that we’re doing some pretty major house renovations and the place is heading into turmoil. I do know that it’ll be worth it in the end (because I tell myself this about 100 times a day) but to someone who is a bit of a control freak the thought of my whole house being turned upside down is a wee bit daunting! I think Annie the pooch and I will be escaping to the shed and barricading ourselves in as much as possible. However the upside of not running any workshops from here over the Autumn is that it is giving me a break to think, to plan and to concentrate on my personal textile projects – and that definitely feels exciting! And now for some actual workshop news. Although I won’t be running any textile workshops & classes from my own studio, the Purple Thread Shed is taking to the road to some other great venues over the next few months. You can find more details here: The Purple Thread Shed Takes To The Road. I’m really excited to be working with Edinburgh Museums for the first time this summer and have created two workshops to support their Edinburgh Alphabet exhibition at the City Art Centre. It’s worth noting that the cost of these workshops is £25 which is an absolute bargain! The first is ‘Patchwood Houses’ which is taking place on Saturday 19th August during the Edinburgh fringe and festival. Perhaps some of you from further afield will be in Edinburgh at this time and would like to join me for the day. 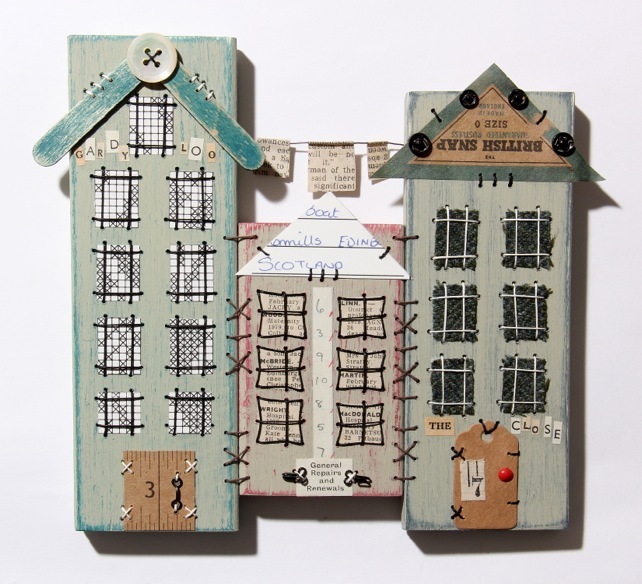 It will be a day of hand stitching with a difference creating a colourful little row of Edinburgh tenements from ‘patches’ of repurposed wood all stitched together. 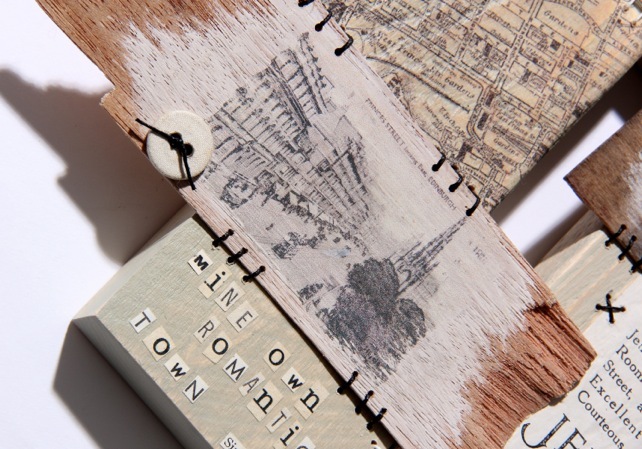 Inspired by the Old Town, you will design your own row of tenements embellished with Edinburgh ephemera, vintage papers, tweeds, floral fabrics and other small treasures all hand stitched into place. Your buildings will then be stitched together to create your own ‘Edinburgh Close’. We can include house numbers, street names and other personal details and I love the little washing line strung across the close. Before you can begin to stitch, tiny holes must be drilled into the wood. By the end of the day you will feel as at home using the drill as you do your needle and thread. You can even add a little washing line strung across the ‘close’. 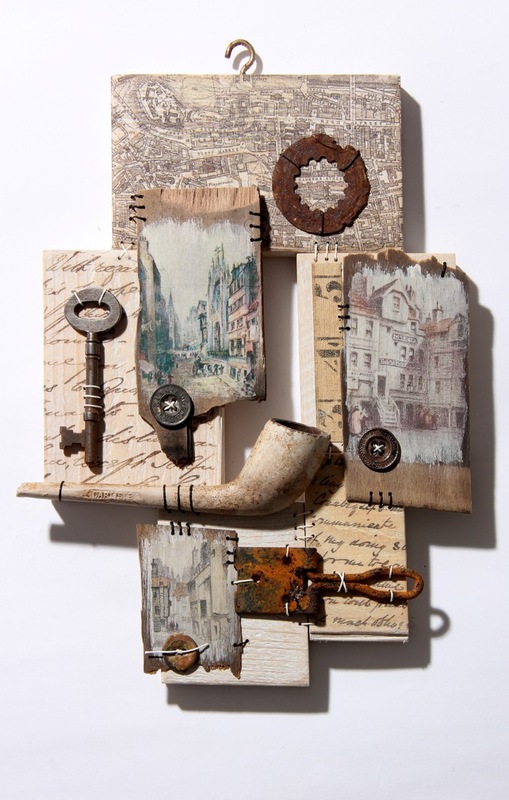 All the materials will be provided but to make your piece even more personal you may wish to bring along some of your own small treasures and Edinburgh ephemera to include. Booking is essential and can be done by contacting the City Art Centre reception on 0131 529 3993. 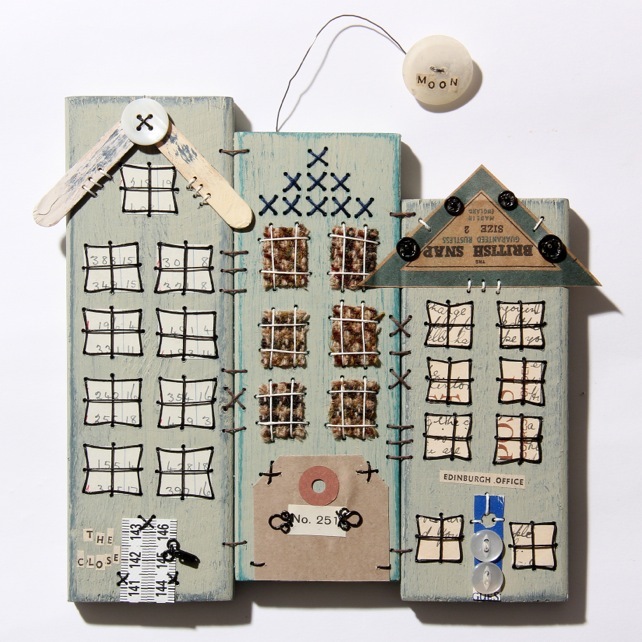 In “Patchwood City’ we will be creating one of my Patchwood Samplers inspired by our beautiful city of Edinburgh. 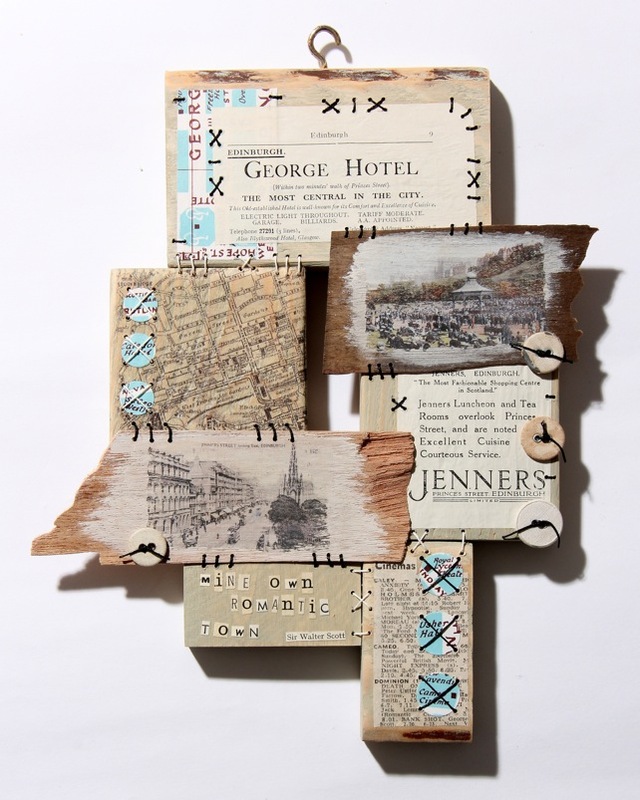 Using “patches” of repurposed wood, you will create your Patchwork piece from vintage Edinburgh ephemera, found objects and images from old Edinburgh postcards transferred onto fragments of wood. Everything will be stitched into place and your “patches” stitched together. Again all the materials will be provided but to make your piece even more personal you may wish to bring along some of your own small treasures and Edinburgh ephemera to include. 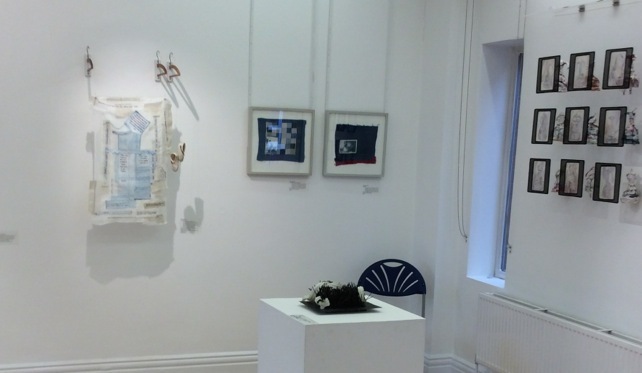 Last Thursday I set off on a wee trip down to Birmingham where I was exhibiting as part of the textile group “Prism” at the beautiful RBSA gallery. At the start of 2016 I made what seemed like a huge decision to stop ‘making’ for shops and selling online and to concentrate my time instead on my own personal textile projects for exhibition. I love to start the year by writing an ‘action plan’ where I set short, medium and long term goals. As a way to move forward my personal textile work, I set myself a medium term goal of joining a UK wide Textile Group with the specific aim of exhibiting further afield in the UK. 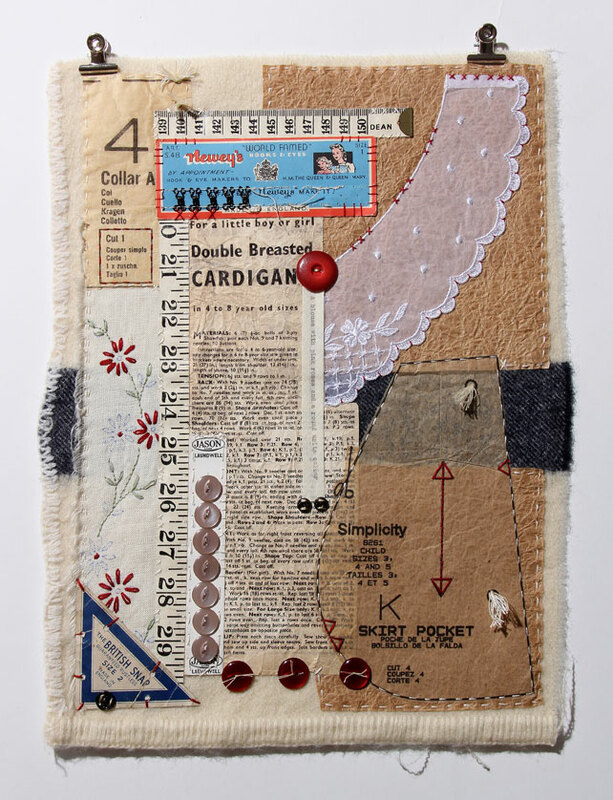 At this point I was already a member of edge- textile artists scotland and knew how well this works for me. Being a member of a group not only gives me deadlines and something definitive to work towards but this, in turn, seems to stimulate my ideas and motivation. Not to mention all of the advantages of being part of a group of likeminded people – especially when I tend to spend a lot of my time working alone. 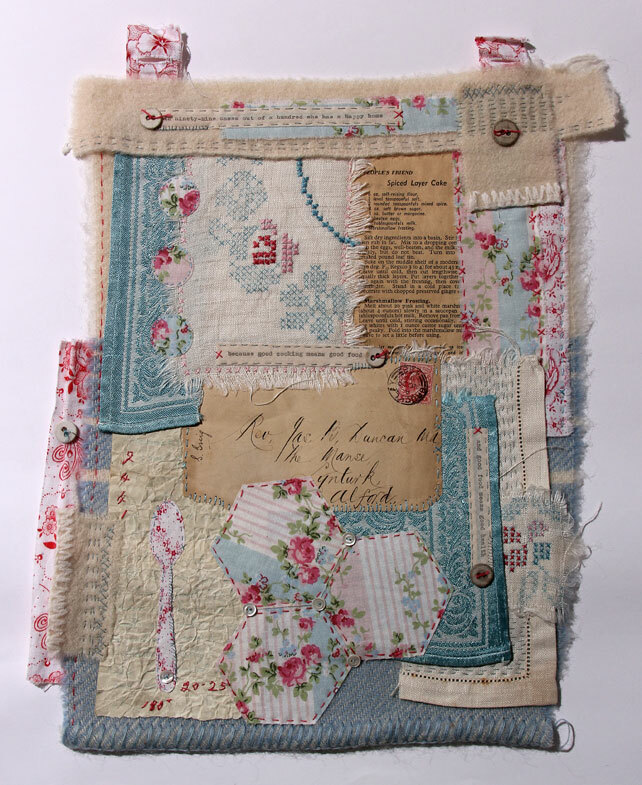 I therefore set out on a bit of research to find a UK wide group and turned to textileartist.org where I found the feature: Top 5 Textile Art Groups. Further research took me to the various websites mentioned and after looking at the work of individual members I decided that I could see my work sitting alongside other members of Prism so I decided to take the plunge and write an application. 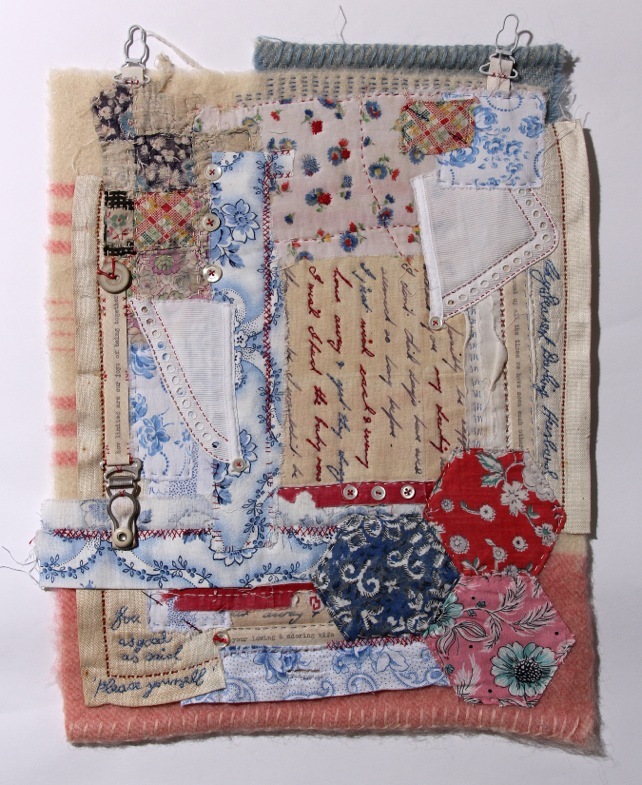 I once more turned to textileartist.org where I found another great feature: ‘Top tips for applying to Textile Art Groups’ I couldn’t believe my luck when I discovered that the article was written by Anita Bruce – one of the chairs of Prism! Anyway to cut rather a long-winded story short, after submitting photographs and statements I was asked to send some of my work down for the selection panel to consider and was absolutely delighted to be invited to join the group. I was even more thrilled when, at the start of this year, the work that I submitted for their 2017 exhibitions ‘Another View’ was accepted for both the RBSA Birmingham and later in the year for Hoxton Arches, London. Now reading that back makes it sound like a very straight forward and painless process – it is SO NOT!! It’s hugely scary to put yourself and your work out there. You are essentially inviting a group of people that you aspire to belong to – to either accept or reject you – yikes!! I actually didn’t make any announcements on Facebook until about three months later because I kept expecting the email to say that they’d changed their mind. Me – paranoid? Not at all!! 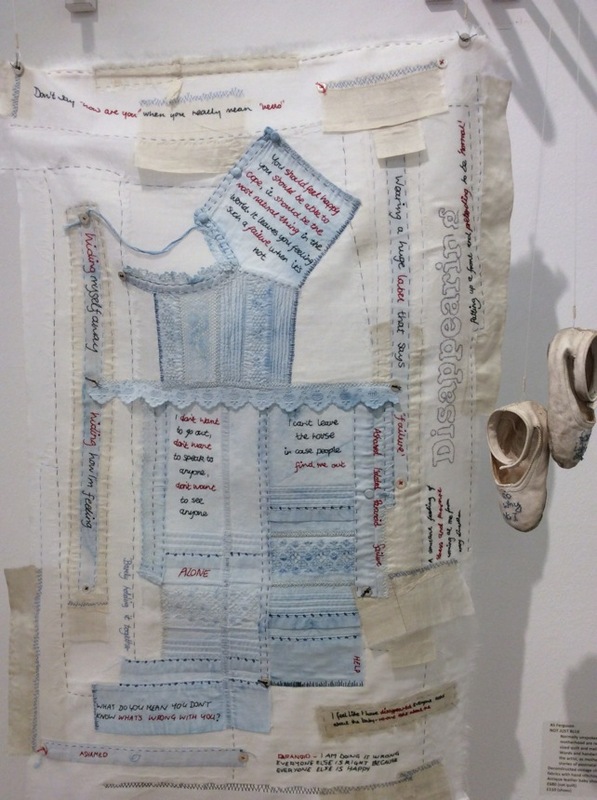 I’ll tell you more about the work I submitted “Not Just Blue” in another post but in the meantime you can find out more in Cloth Work. The exhibition itself absolutely lived up to expectations. Spending a day stewarding in the gallery allows a glimpse at the public’s reaction. I love how something will catch someone’s eye the moment they walk through the door and they’ll be drawn straight to it, for that moment not seeing anything else around it. And the best of it is that each person will be drawn to something different. I love too when someone calls over their companion to point something out and an enthusiastic discussion takes place. I quite like when arms get tightly folded across the body but the person continues studying – you know that something has touched a nerve. And of course there’s the moment when someone’s face lights up and you know that they’ve just experienced that slightly breathless sensation of when something has touched the heart and is ‘speaking’ to them. Also, of course, it is such a thrill to see your own work hanging in the space. No amount of ‘mocking up’ at home compares to the moment you walk into the gallery and see that after all of the many hours of work that your piece ‘fits’ and that your idea for hanging ‘works’. I gave a huge sigh of relief when I first walked through the door and saw my quilt hanging, and then later in the day I couldn’t help a wee smile of pleasure as we opened the window and it gently moved in the breeze, casting its shadows around it. I made a wee pledge with myself that when writing my blog posts that I would try and give a ‘real’ account so I’m sharing the conversation that took place between me and my other half when I first saw a photo taken at the exhibition opening. ‘Me being me’ means that despite having had my pieces accepted for the exhibition I don’t dare believe that they have actually been included, until I see them with my own eyes! Me: ‘Yes they are looking at it. How cool. And it looks like they’re talking about it – amazing! Short pause – D’you think he’s saying that it’s sh** and has to come down?! How exciting – a shiny new website and a brand new blog! I’ve been meaning to update everything for such a long time and it all seemed rather overwhelming. However, having made the decision to enlist some help in the form of a professional web designer, the whole process has been a joy and here we are – ta da!! So welcome to my blog!! My plan is to use this space to record some of the “happenings” in The Purple Thread Shed – in my workshops as well as my own personal projects. I’d love to share some of the stories behind my artwork – from the initial idea (which usually takes place around 3AM) to the thinking behind the materials used and through the process itself. I’d like to think that this will be a ‘real’ account – an actual scrapbook of the ups and downs of leading a creative life, working on my own, battling with insecurities as well as sharing all the exciting bits. 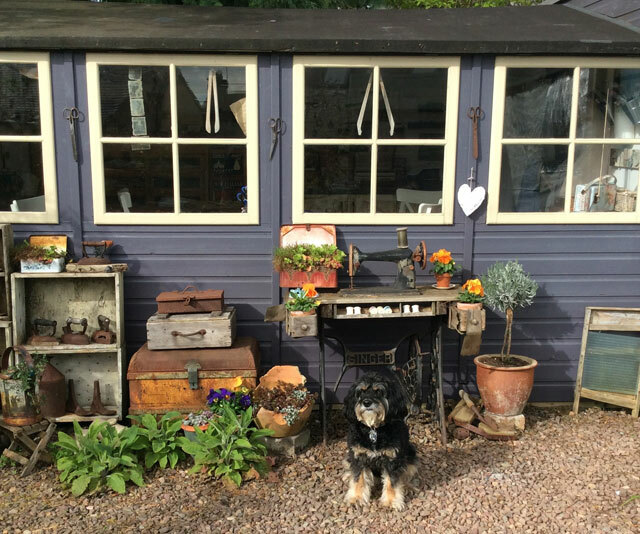 We will, of course, be joined by Annie the Thread Shed pooch. She takes her “job” of welcoming people very seriously so it seems fitting that she does the first welcome to the blog. I do hope that you will return to find out what’s going on and do please feel free to leave comments. I’m always up for a wee chat! 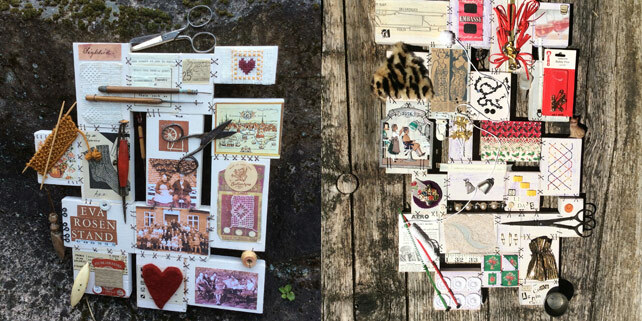 Lastly a huge thank-you to Fiona Dix of hiraeth mixed media for creating such a fabulous website and also Michael Graham of The Studio, Penicuik for many of the fabulous photographs throughout my website.